Lighting manufacturers, through their trade association the National Electrical Manufacturers Association (NEMA), developed lamprecycle.org to provide a one-stop source of information about recycling lamps (the term used in the lighting industry to refer to all types of light bulbs). Easy and convenient options exist for both businesses and consumers to recycle waste mercury-containing lamps. It is estimated that businesses already recycle over 30% of their waste lamps annually and consumers are embracing lamp recycling as they switch to more efficient lighting technologies. Fluorescent and compact fluorescent lamps (CFLs), high intensity discharge lamps (HID) lamps contain a small amount of mercury and are identified with the elemental symbol Hg . CFLs average less than 4 milligrams of mercury - about the amount that would cover the tip of a ballpoint pen. By comparison, older thermometers contain about 500 milligrams of mercury - an amount equal to the mercury in 125 or more CFLs. 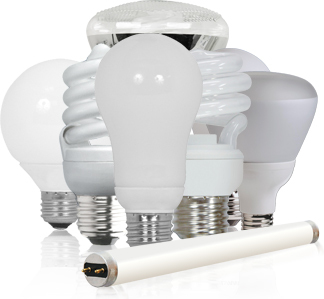 Eleven states and multiple local jurisdictions prohibit the disposal of mercury containing products, including CFLs and other mercury containing lamps, in solid waste. By recycling a mercury containing lamp, you'll ensure that 99.98% of the mercury used in the lamp is recovered. Manufacturer investments in technology over the last two decades have reduced the amount of mercury used in lamps by nearly 95%. The mercury in lamps is essential to their efficient operation; no alternative will achieve comparable energy efficiency.